Is it the Key, or the Steering Lock? 05 Jan Is it the Key, or the Steering Lock? How to tell if your Mercedes key is broken, or if it’s a steering lock problem. 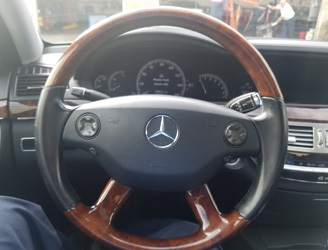 Especially if you drive a C-class Mercedes Benz between the years of 2009 and the current year, it’s worth it to try some steering lock troubleshooting before determining that the problem lies in your Mercedes Smart Key. Since this is part of the security system of newer Mercedes, it is meant to lock up if it senses anything amiss. If you insert your key fob and it won’t turn, try moving the steering wheel as you also turn the key. The wheel will feel fixed in position in one direction but will have some give in the other direction. Turn the wheel in that direction, then insert the key and try again. But do not force the key to turn! If it’s still not turning after wiggling the steering wheel around a bit, there may be a problem with the steering column itself, or the problem is within the key. However, if you drive an S Class Mercedes, the lock-up happens in the shifter, not hte steering wheel. You may have tripped the Driver Authorization System.